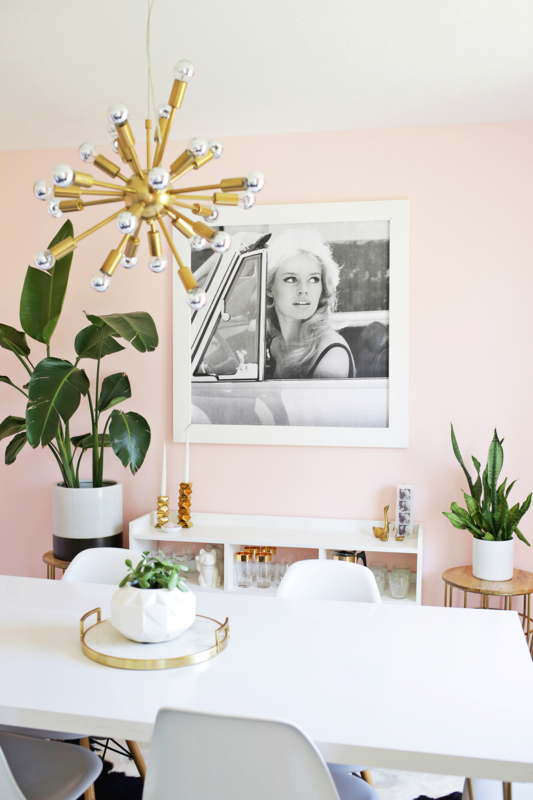 Laura added blush pink paint, a retro chandelier (here’s a similar style) and her signature gold and white accents to transform her front/dining room. Without a doubt, the most special before/after was our entire Habitat for Humanity house project—this house was in desperate need of some love. 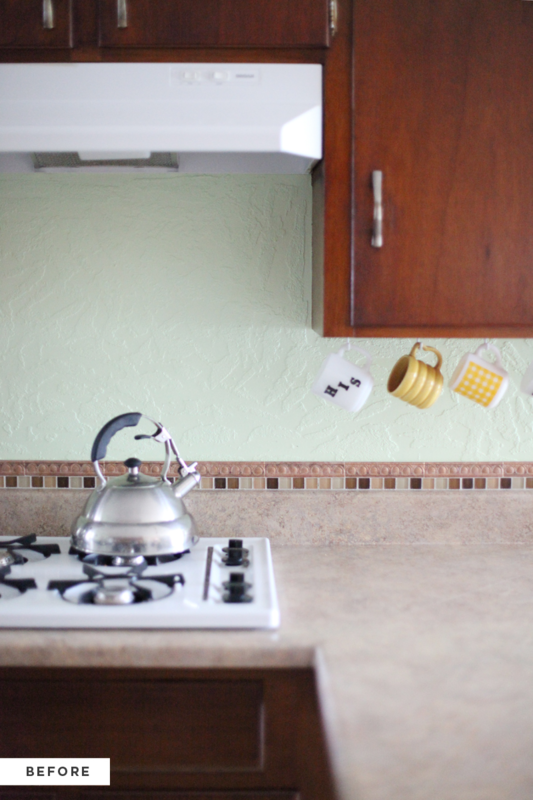 Click here to see more photos of this bright kitchen. Elsie’s breakfast nook was what some would call kitschy, but not quite her style. 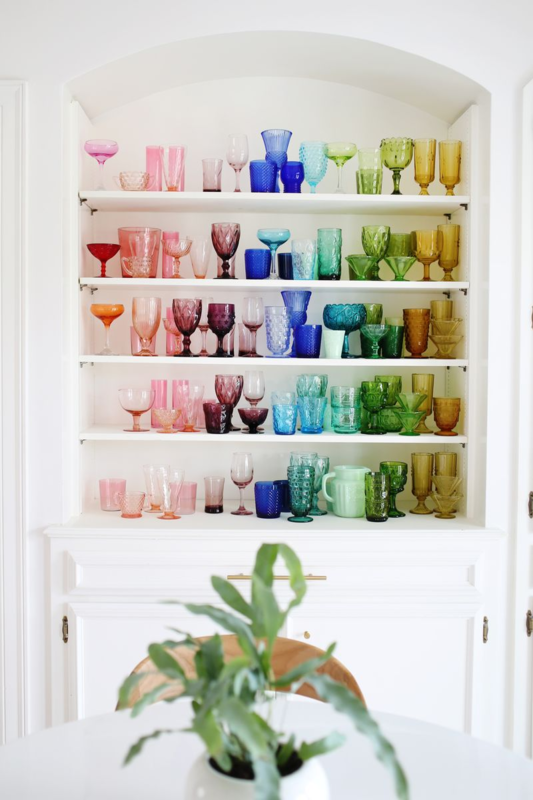 She made it her own with a fresh coat of white paint and her colorful glassware collection. We used this space for meetings and prop storage, and as you can see from the before, it’s hard to tell it’s the same room! 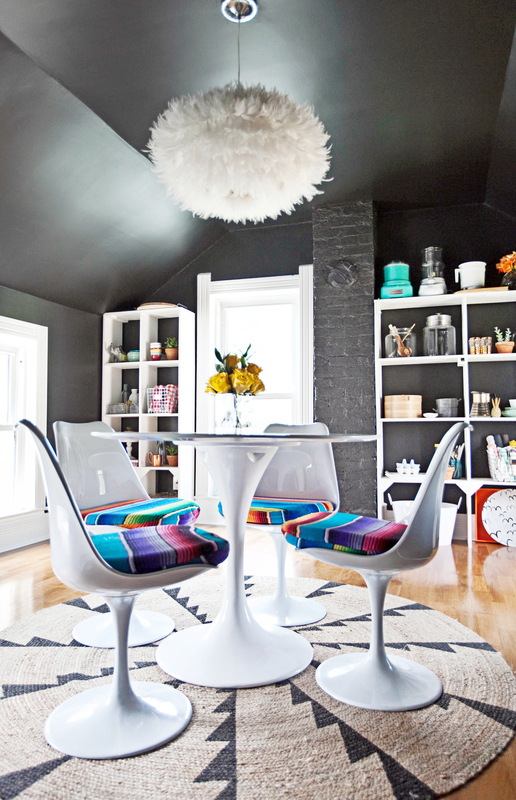 We decided to go for a bold look with black paint and a (DIY) feather light fixture. 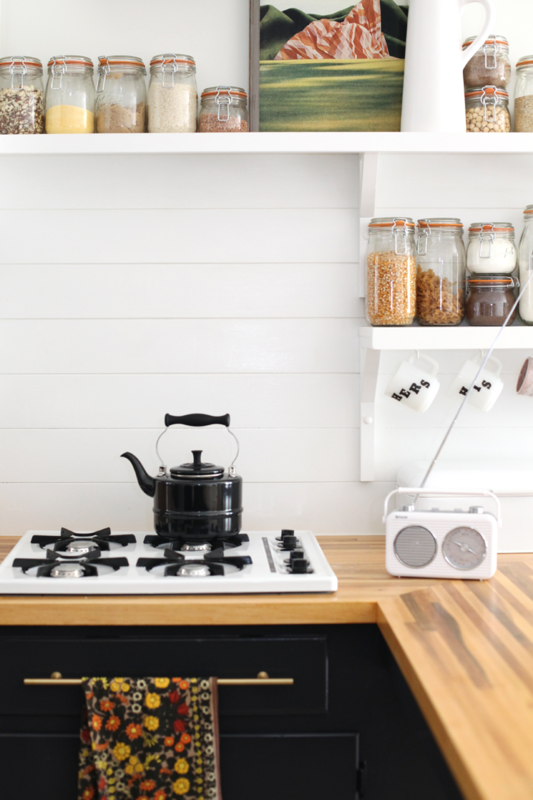 Mandi gave her kitchen a serious makeover (see the final reveal here) and we’re still loving the plank backsplash she made. 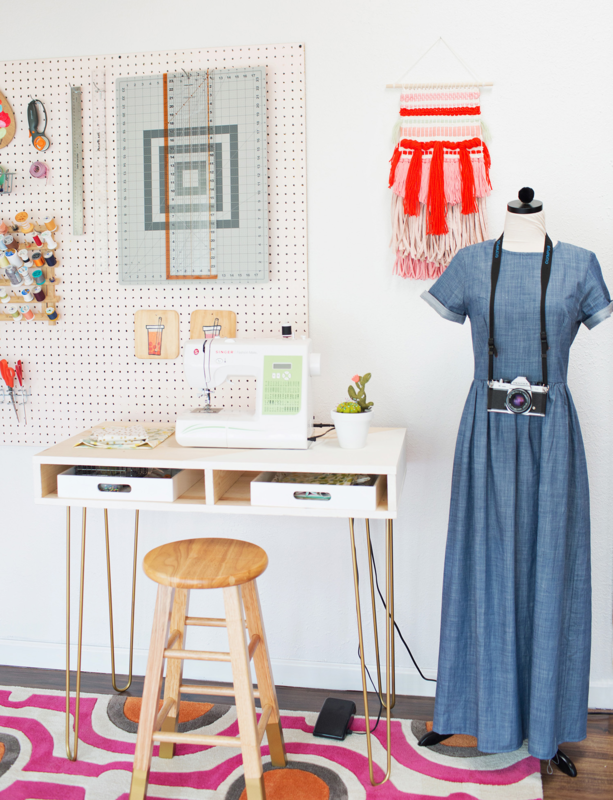 That’s right—she’s a DIY genius! 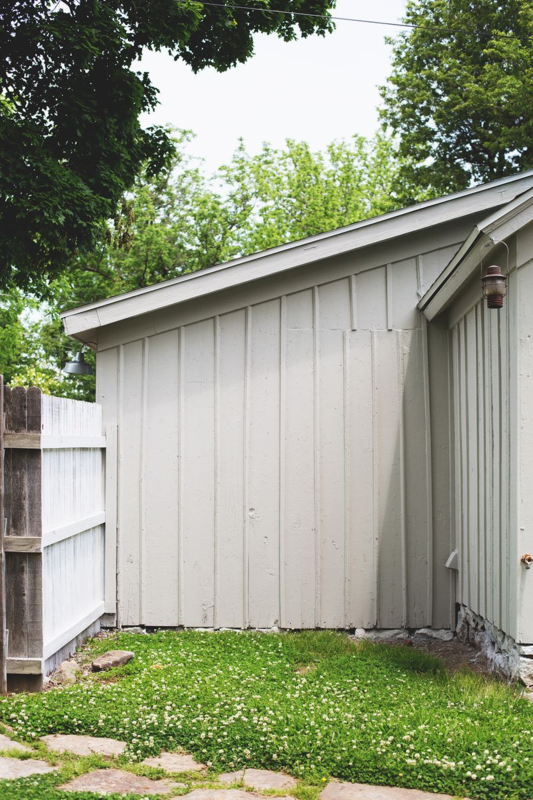 If you’re renovating on a budget, be sure to check out this one. Um … WOW. 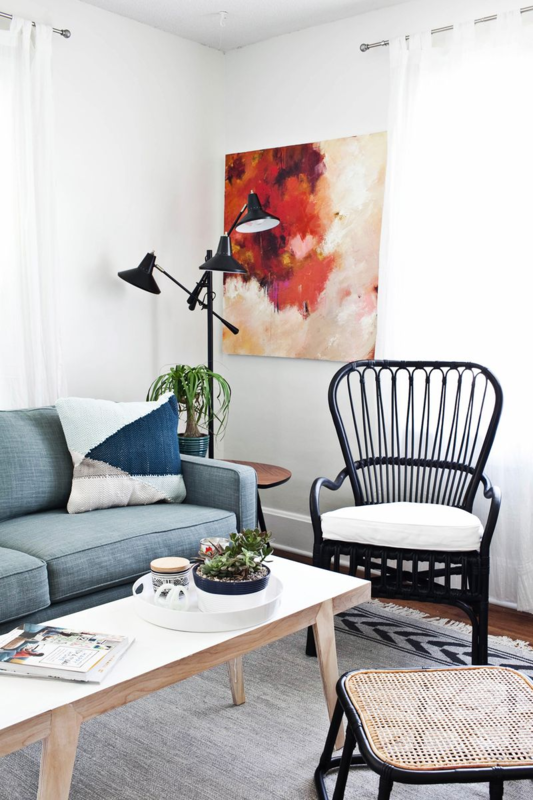 Emma’s home office is anything but drab. Her goal? Add better lighting and more color. 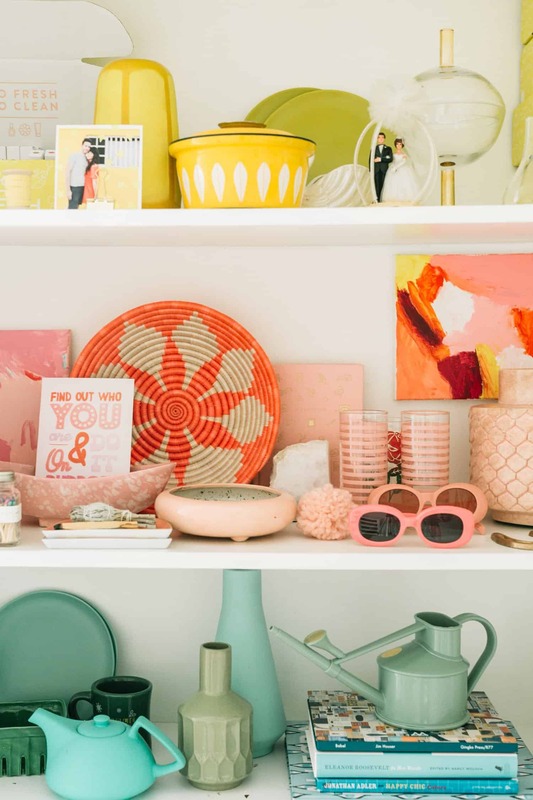 She added this amazing light fixture and created the happiest palette. 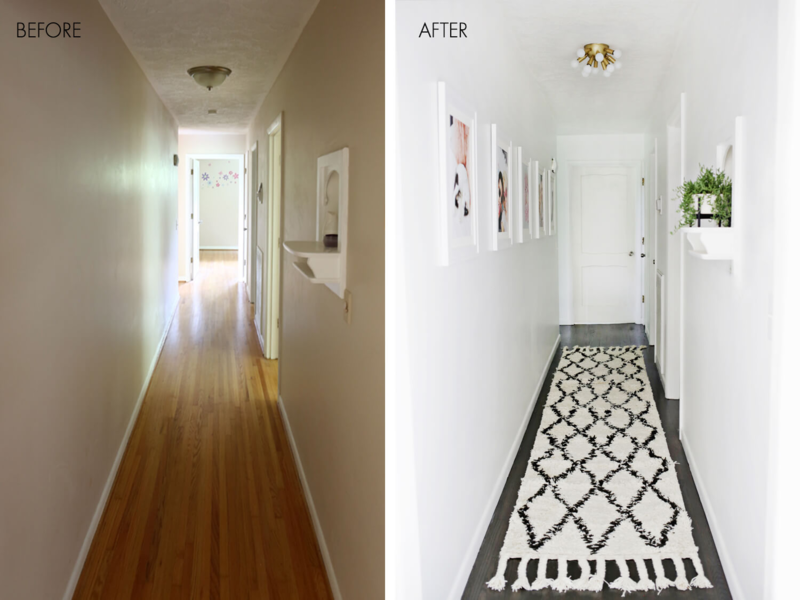 Even though you aren’t dealing with a lot of space, hallways can be hard to “get just right” when decorating. Here’s five tips that are super helpful. So.much.wood.paneling. Haha! 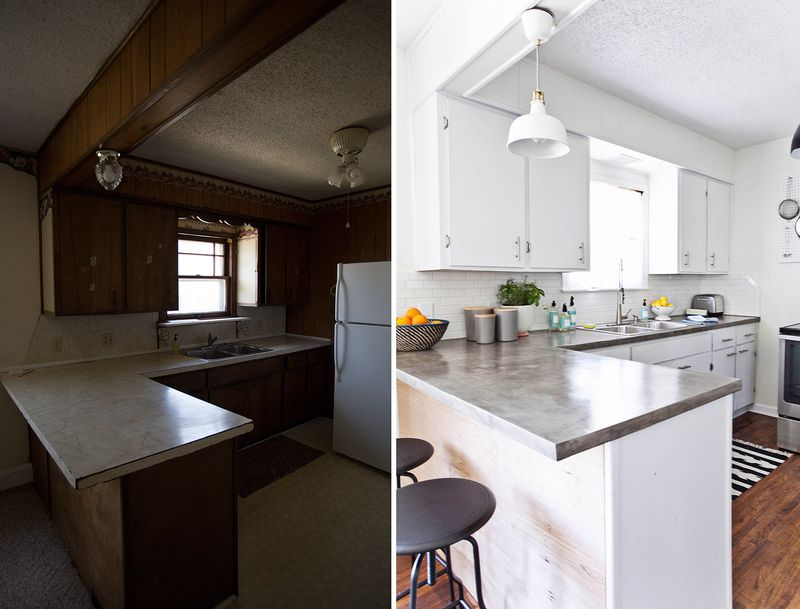 To this day, the ABM studio kitchen is our favorite before/after. 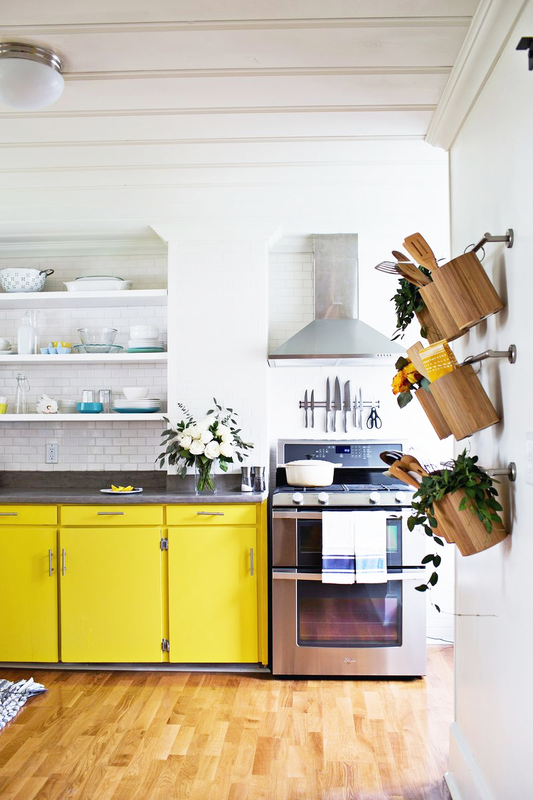 Among many things, we added concrete countertops, a window ledge plant shelf, and sunny yellow paint. 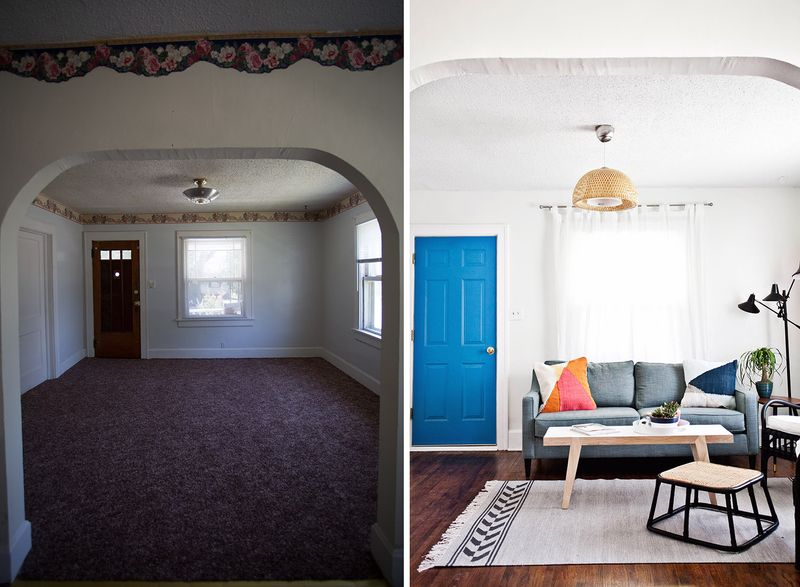 How is this the same living room? 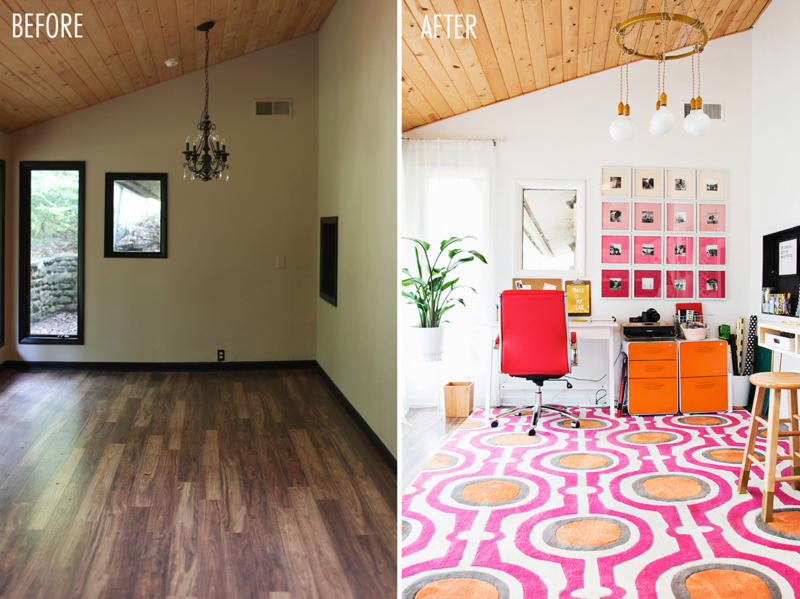 Elsie had a vision when she bought her home, and this was one of the first rooms to get a big makeover. The first step? 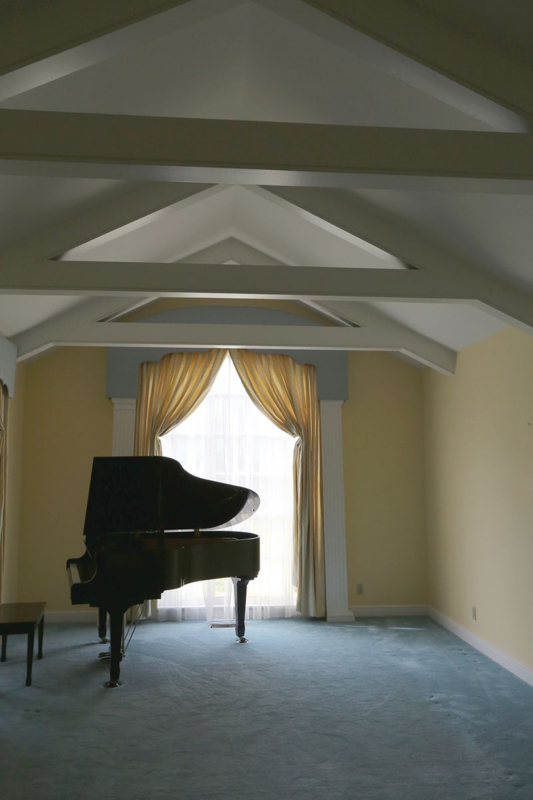 Removing the old blue carpet and adding color washed floors. This outdoor space reminds us of summer (miss you) but we wanted to include it. As you can see, there wasn’t much going on before we added the bench, concrete block floor, DIY pillows and cushions. 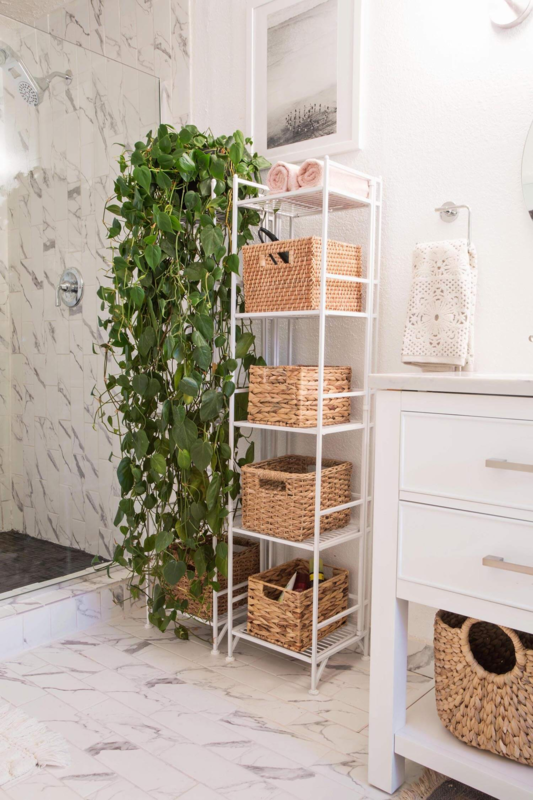 Emma’s master bathroom got a major tile upgrade, extra storage, and plenty of spa-like vibes. 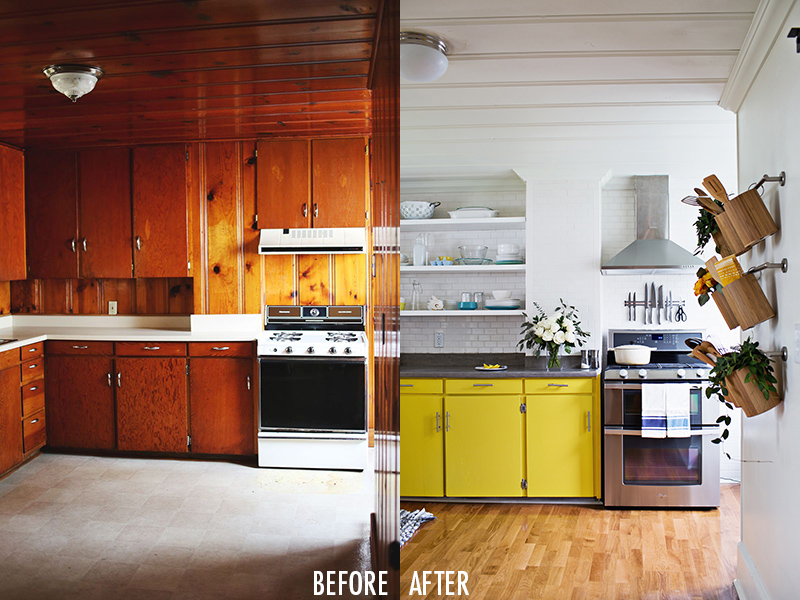 Another crazy good before/after from Elsie’s home—her kitchen! 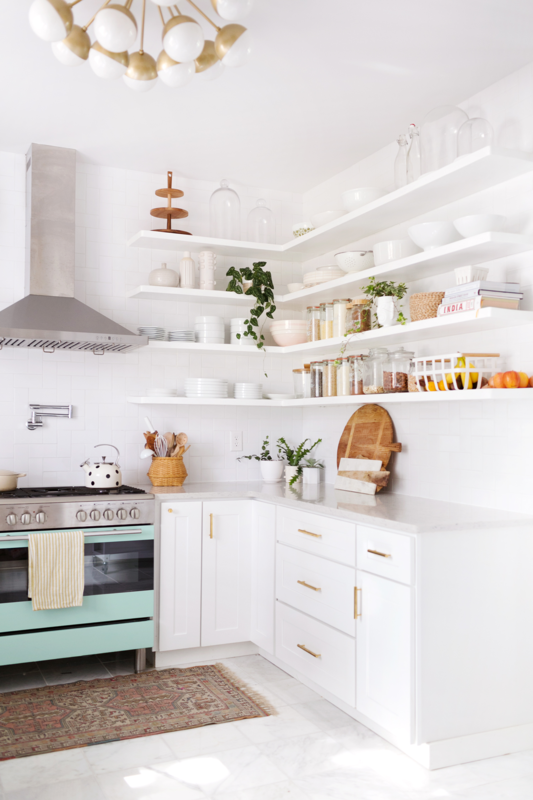 From the open shelving to the recolored appliances, it’s pure perfection. 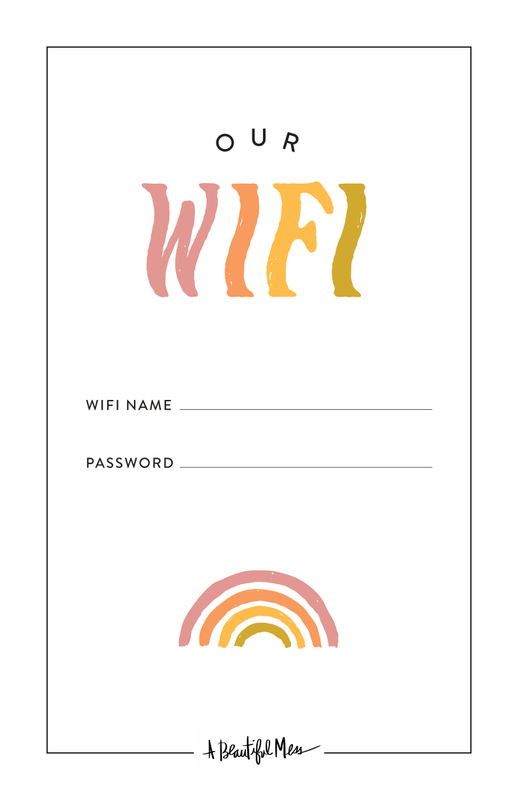 One way to make a big impact without spending a lot of money? Paint your front door a bright, bold color. 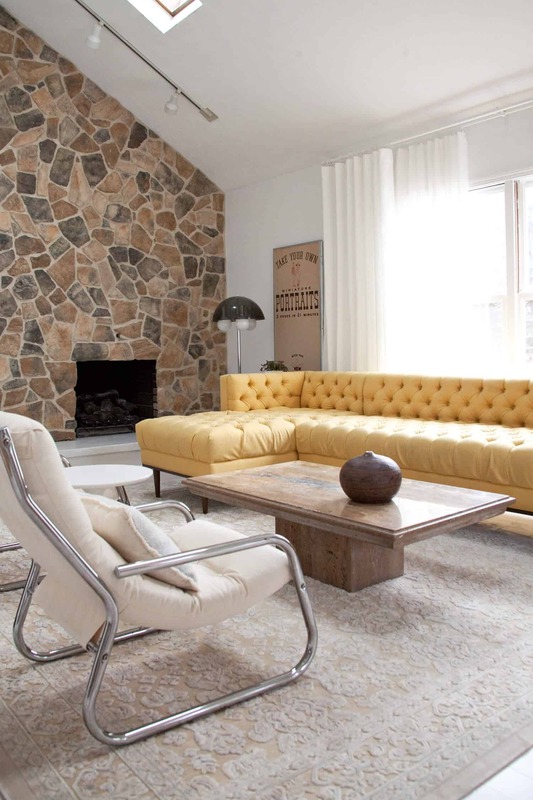 That, along with white walls and cozy decor, made the Habitat House living room so inviting. Another OMG moment? Laura’s backyard patio.The (DIY) painted tile really made the space. 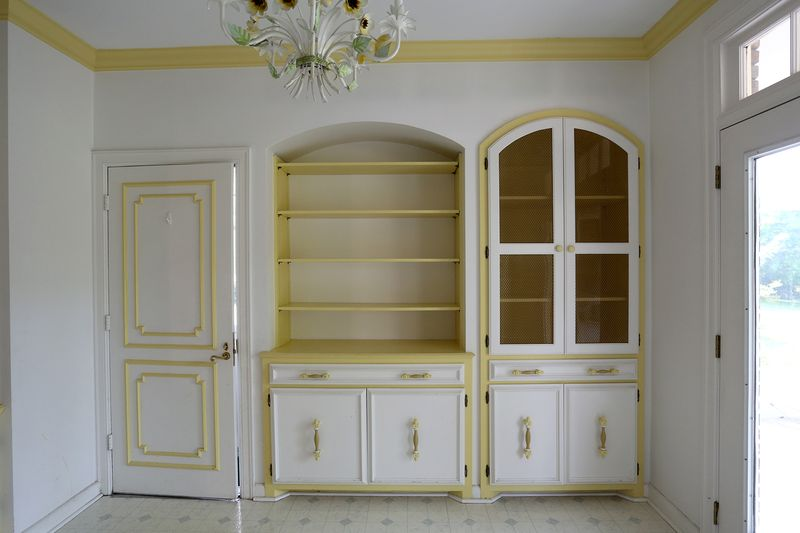 But it wouldn’t look as good if she hadn’t painted the outside of her home white. Elsie did the same thing to hers and the difference is pretty amazing. 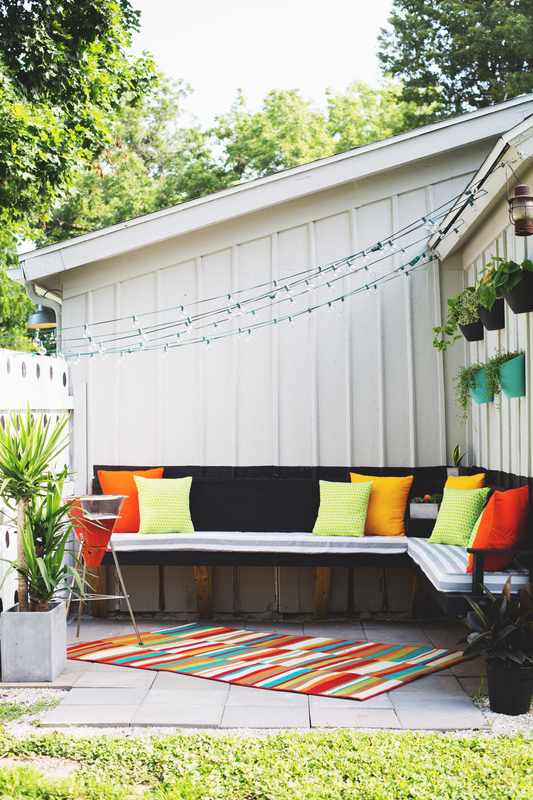 If painting the outside of your home isn’t in the cards, you can still do so much to update a patio, like adding pretty lighting, planters, and new furniture. We’ll be back soon with round two! 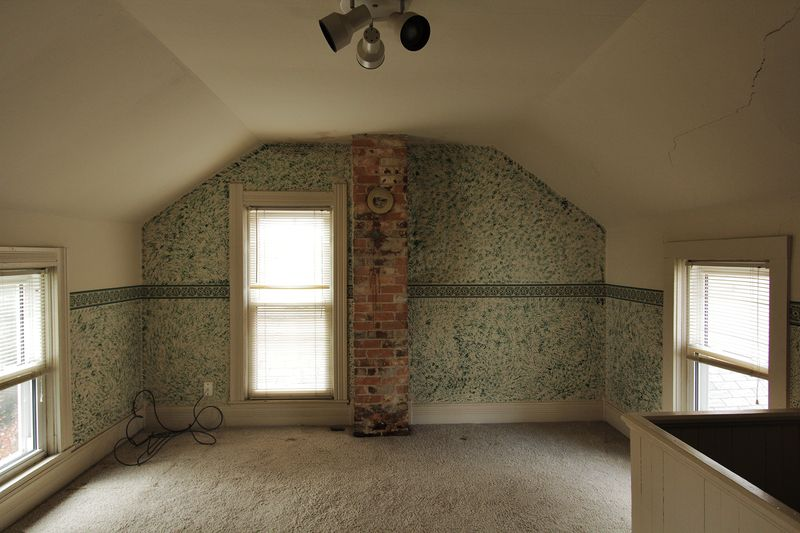 In the meantime, you can see our before/after archives here. 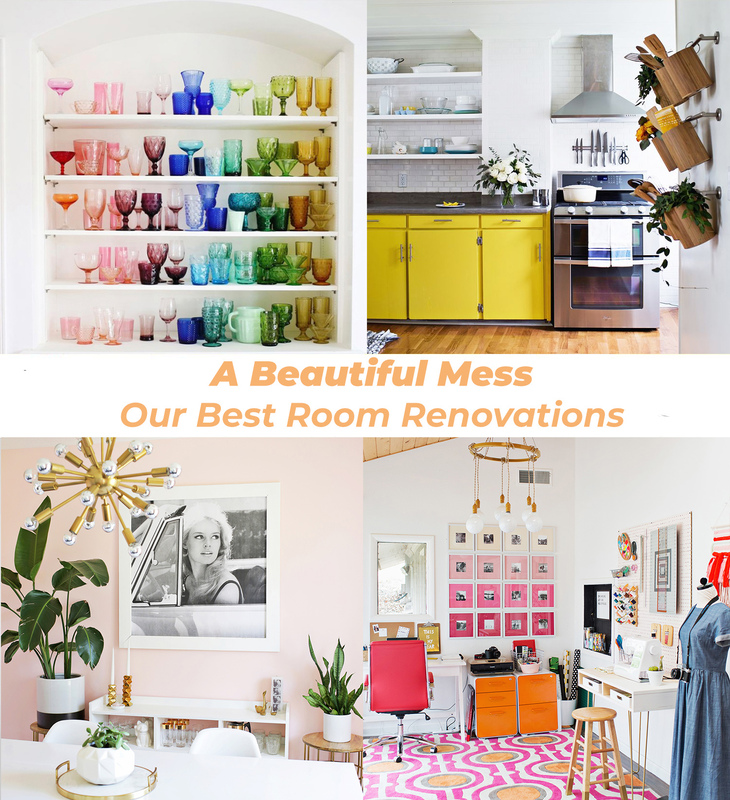 Do you have a favorite room renovation on the blog? Let us know in the comments! xo. 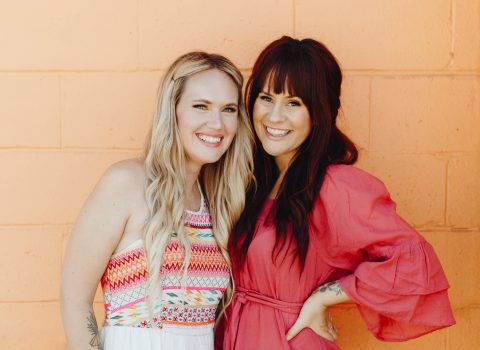 Awesome post, great job girls! All of them are amazing! I love the light in your photos! and in the interiors you decorated! I think I’ll start painting most of my home white! seems like the style is paint everything a fresh coat of white, add bold colored accents, dark floors, textured accent wall. 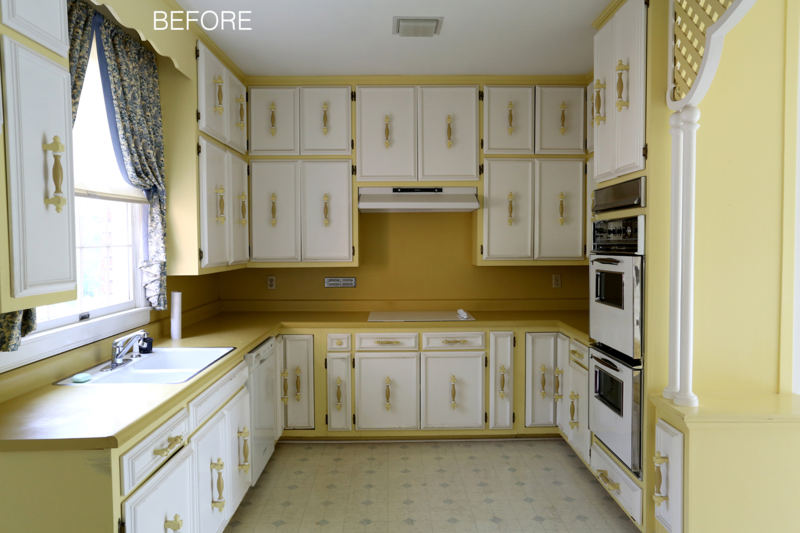 I’m definitely a big fan of your kitchen renovations, they just look incredible! I love all of these renovations! 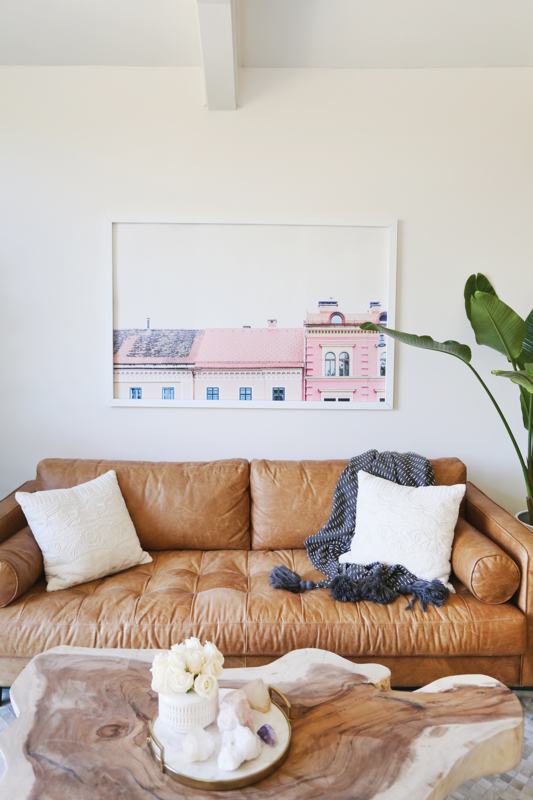 My favorite has to be that black painted room with the DIY feather light. I love the drama the contrasting colors add. It’s beautiful. I love the renovations; they are so inspiring. 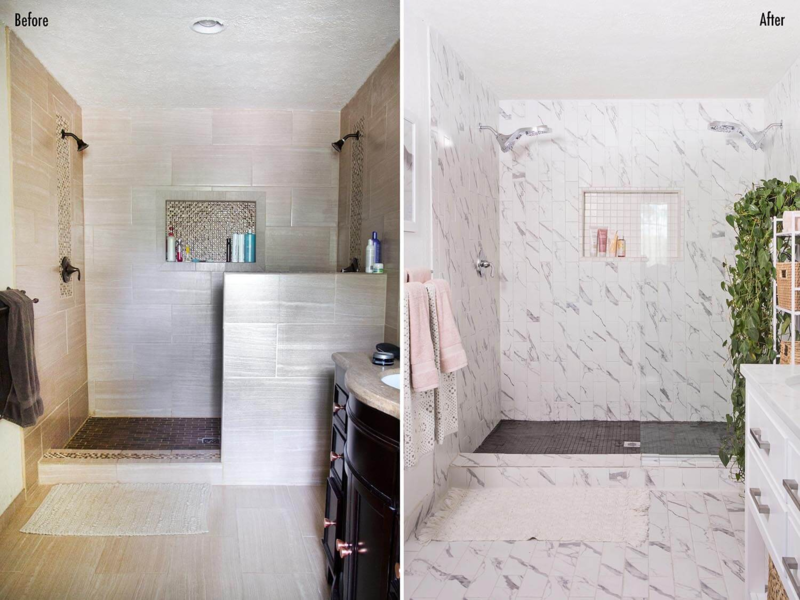 But is it necessary to always show a super-dark “before” picture to make the “after” one look even better? I would love to see a before pic with the same flash and filters to really get a sense for how the living areas have changed regardless of the camera manipulations. agreed. I had the same thoughts. These are all so beautiful. 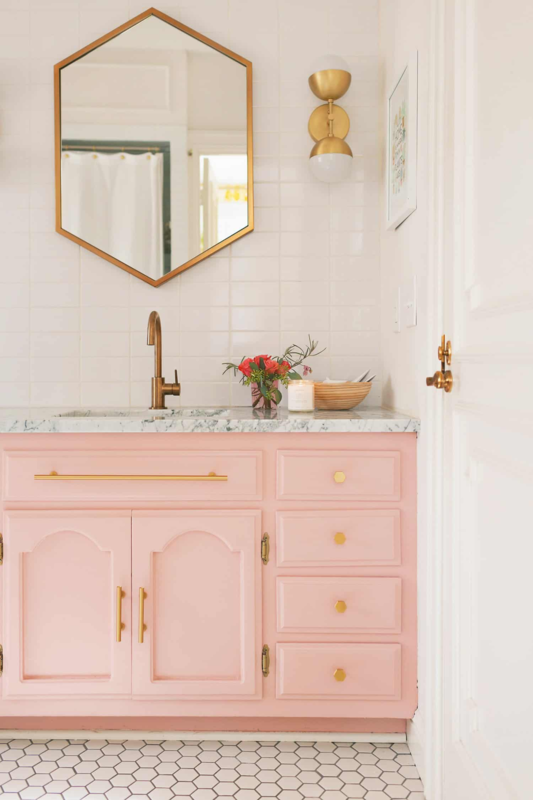 I especially love the master bathroom redo. 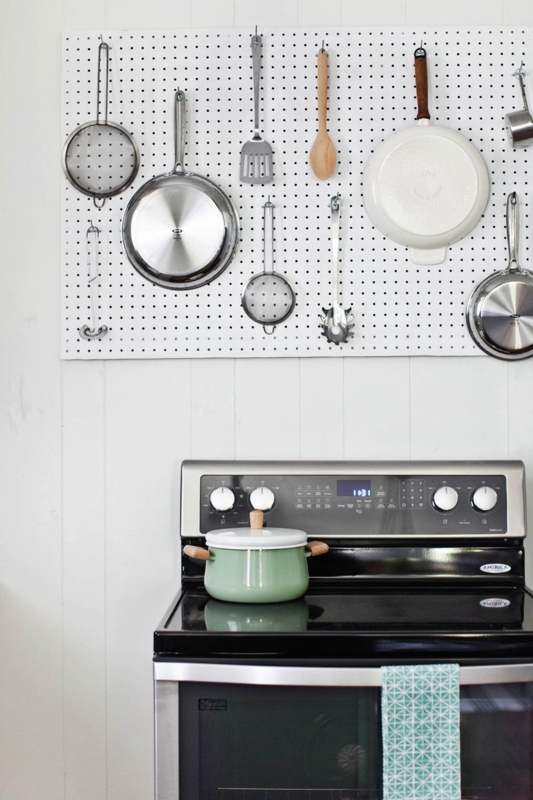 The tile is so great!